BIG IMPLICATIONS for such a Small Book! 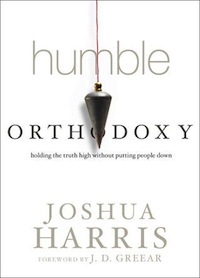 I just read Joshua Harris’ book, “HUMBLE ORTHODOXY: Holding the Truth High without Putting People Down” and it will certainly go down as one of the most relevant books I’ve read this year. Harris’ book is a timely and relevant book for a time when more and more people are straying from Christian orthodoxy. The word ORTHODOXY refers to right thinking about God. Joshua Harris list Christian orthodoxy in terms of the historic creeds of the faith: There is one God who created all things. God is triune: Father, Son, and Holy Spirit. The Bible is God’s inerrant word to humanity. Jesus is the virgin-born, eternal Son of God. Jesus died as a substitute for sinners so they could be forgiven. Jesus rose from the dead. Jesus will one day return to judge the world. Harris points out that one of the problem with the word ORTHODOXY is that it is usually brought up when someone is being reprimanded. What Harris recommends is something he terms “HUMBLE ORTHODOXY,” in which Christians have a strong commitment to sound doctrine, but we also need to be gracious in our words and interaction with other people. The bottom line is that TRUTH MATTERS… but so does our attitude. It’s possible to be right in our doctrine, but wrong with the attitude that we impose that doctrine on others. Harris points out other destructive options to HUMBLE ORTHODOXY: 1. One is ARROGANT ORTHODOXY in which we are right in our doctrine but are unkind and unloving, self righteous and spiteful in our words and behavior. Harris writes, “One of the mistakes Christians often make is that we learn to rebuke like Jesus, but not love like Him.” 2. The other option is HUMBLE HETERODOXY in which a person abandons some of the historic Christian beliefs but is a really nice person who can’t bear to offend unbelievers or the general culture and seems open to almost any teaching in the name of inclusion, kindness, and open-mindedness. This approach avoids conflict. Harris spends the rest of the book flushing out the implications from these extremes and gives useful guidelines on how we can embrace a HUMBLE ORTHODOXY. J.D. Greear gave a short and to the point summary in the forward of the book: Pharisaism has less to do with what doctrines we hold than with how we hold them… getting doctrine right is a matter of life and death, but holding the doctrine in the right spirit is essential too. A great deal of damage is done by those who hold the truth of Christ with the spirit of Satan. The book is an extremely easy read with only four chapters long for a total of 61 pages. The last part of the book are 18 pages of extremely useful study questions both for private reflection and group discussion. I give the book a SOLID 5 Stars and consider it a must read. I received this book free of charge from Multnomah Press in exchange of a bias free review.